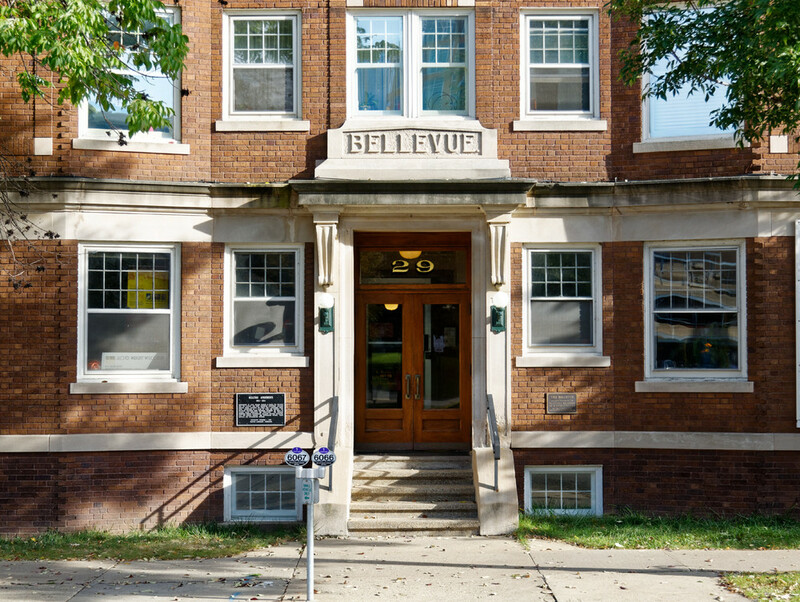 Bellevue Apartments: historic, charming, community oriented, located in the heart of Madison. Apartments designed to make the everyday special. Overlooking Lake Monona, the Bellevue Apartments offers a unique lifestyle in the heart of downtown. 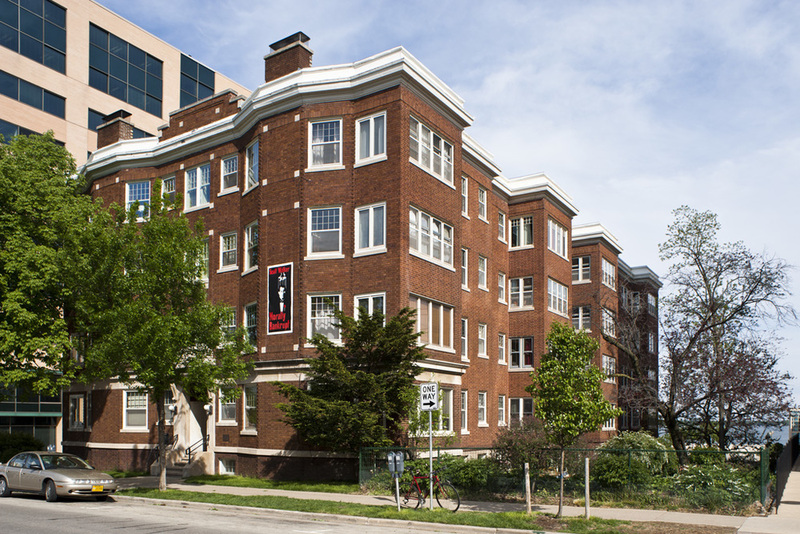 The Bellevue — constructed during Madison's pre-World War I economic boom — features apartments in a variety of layouts, along with amenities like a garden with grill, parking, laundry, and private storage located on site. The Bellevue is located at the intersection of East Wilson Street and South Pinckney Street. Click here for map. View from E. Wilson St.
View from corner of East Wilson and S. Pinckney St.
View from S. Pickney St. The Bellevue is more than just a charming building – it's a community, and any good community comes with amenities for the residents. When the Bellevue was built, only the best services were installed. Today it continues to provide everything you need. Wireless internet, heating, water, trash, and gas for the range are all included with the rent. Lovingly maintained garden with herbs, grill, and picnic tables is available to all tenants. Individual and tandem (shared) parking spots are available behind the building. Check with the property manager for availability and pricing. Bellevue residents love their bikes, so indoor bike parking is accessible at street level. Secure storage cages are available upon request at no additional cost. Coin operated washers and driers are located on the ground floor, easily accessible via elevator. Please note that the Bellevue is a non-smoking environment. Dogs are not allowed, cats only by permission. By today's standards the apartments are cozy, but the elegant touches are still evident. Woodwork is deep and elaborate, and each apartment has a living room fireplace and hardwood floors. Bookcases with leaded glass have trick doors below them, which hid Murphy beds that could be pushed into the living rooms, or three-season porches, then flipped up when not in use. Each unit has natural light that enters through four shafts that run vertically through the building. Constructed by local builder Charles E. Marks, the Bellevue was the largest and most expensive apartment building erected during Madison's pre-World War I apartment house boom. Advertised as a place of "ease and comfort," the Bellevue featured such Victorian luxuries as built-in leaded glass bookcases and fireplaces. The kitchen are cozy, but tenants back then had no need to cook since their meals could be delivered via a dumbwaiter from a kitchen in the basement. Laundry, too, could be sent down as well to be washed and ironed. A system using brine in the basement pumped cold water into tenants' ice boxes, and there was central vacuum. Garbage wasn't a chore, either, because chutes on each floor led to an incinerator in the basement. An elevator has been there since the beginning, and the current one was installed in the 1940s. 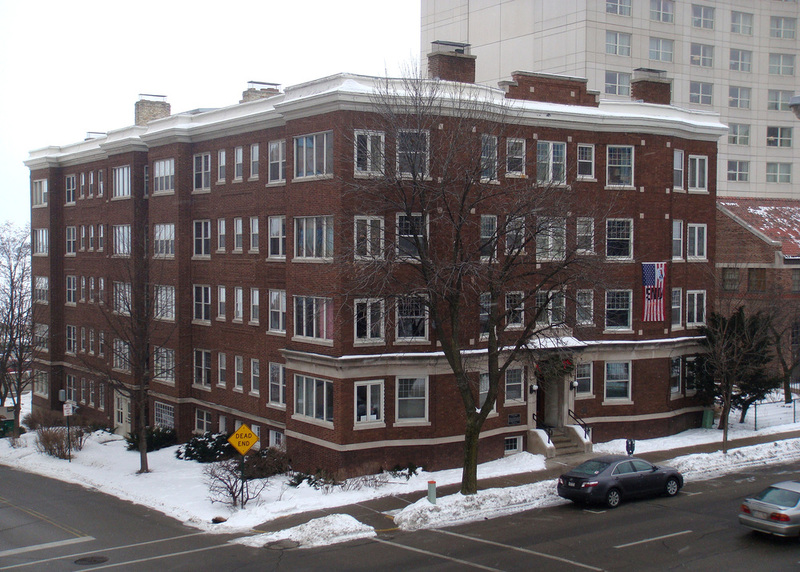 The Bellevue's importance in Madison's history, is that it is not only one of the city's earliest apartment buildings, but one of the biggest and most luxurious. It went up at a curious time in the city's past, when both streetcar suburbs such as University Heights and Westmorland were springing up, but Downtown density was growing. Living it up in downtown Madison. Nestled between Lakes Mendota and Monona, the Capitol Neighborhood encompasses the State Capitol and some of the oldest residential neighborhoods of Madison. Located next to Frank Lloyd Wright's Monona Terrace, residents are only a few block's walking distance from fine restaurants, hip bars and coffee shops around Capitol square, and the famous Madison Farmer's Market (the largest producer-only farmer's market in the country). Residents seeking a quiet and convenient living experience in the Capitol Neighborhood will find it in the Bellevue Apartments. Running and cycling enthusiasts love the proximity to the Capital City Bike Trail. View of Capital City Bike Trail from Monona Terrace, 1/2 block from the Bellevue Apartments.